Reluctant to give up the last vestiges of autumn vegetables I recently bought a large bag full of Romano green beans. Many recipes you read using these wide flat beans with an Italian heritage allude to toughness and recommend a long cooking time, but I’ve never found I need to treat them any differently to round green beans. They will be deliciously tender after being cooked for just six minutes. The only real difference between Romano beans and any other green bean is the colour. Romano beans are a muted shade of green with a slight grey tinge, and even after careful cooking they lack the vibrance of their slender French cousins. I tend toward the flavours and ingredients of salade nicoise when it comes to dressing up beans to make a salad, but sadly the tomatoes have lost their summer exuberance and the chilly nights have finished off my pot of basil. The parsley, still struggling to maintain it’s dignity in the cold begged me to finish it off so the large bunch I snipped became the basis for a delicious parsley pesto dressing for the beans. The beauty of using parsley in pesto is that it doesn’t oxidise like basil. The fresh vibrant colour will linger on for days. It’s also delicious as a potato dressing, dolloped on chicken and fish or even on a humble cheese sandwich. My finished recipe will generously fill a measuring cup and it freezes well. In the food processor, blitz the clove of garlic, then add the walnuts and process until roughly chopped. Add the parsley, process until chopped and then with the motor still running drizzle in the olive oil and lemon juice. Season to taste with salt and pepper. 2 heaped tablespoons of parsley pesto. Bring a large pot of salted water to the boil, then add the beans and cook for 6 minutes. Drain the beans then refresh in cold water. Drain then dry the beans on a clean tea towel. Toss the beans, olives and pesto together and serve immediately. Lovely bean dish and a reminder that we don’t have to give up pesto – as the basil slowly fades from the garden , the parsley takes pride of place again. To be brutally honest I prefer the fresh flavour of parsley pesto over the more traditional version from Genoa! It’s definitely a welcome fresh flavour over winter! Sandra, I am feeling deprived now. I have never seen those beans here in the West. Would you believe we had for dinner the last of my bean crop? Lovely looking salad. I used the last of my frozen pesto last night and now all the fresh herbs are coming in again. I will have to look out for those beans, they look fun and sound delicious. I think Romano beans might be a late autumn crop, but the parsley pesto would be delicious on tender young French beans too..
Have just been for a look-see with Mr Google ’cause these look way wider than the ones I can usually buy! And they supposedly also come in yellow and purple: OK, homework ahead again! The parsley pesto and kalamata olives would really add heaps of flavour . . . have to search, buy and try!! Eha, Romano beans are about 3cm wide, 20cm long and very flat. The flavour is superbly beany. I hope you’re able to find them to try.. I haven’t seen any of those beans in these here parts. Love their pretty green colour against the fab wooden bowl Mrs R. Super. Thanks Cheery, everything looks good in that bowl, it’s an old favourite. Are these Romano beans similar (or the same) as we in the UK call runner beans? They are favoured here, sometimes over their smaller, round French cousins. They are easy and beautiful plants to grow with gorgeous scarlet flowers. You are right about that oxidising with basil. Pesto and salsa verde made with it needs to be made and eaten right away. Have frozen basil pesto (minus cheese), but can see that parsley pesto might do better – a more resilient herb! Debi these are twice as wide, about 3cm, quite flat, but the flavour is similar, much tastier than their round cousins. The seeds inside are reasonably large too. Sounds exactly like runner beans! Yes, they do have a bit more flavour than French beans. On the picture it looks like runner beans to me. However, when you boil our runner beans for just 6 minutes, they will ‘squeek’ unpleasantly when you eat them. Unless of course you add baking soda to the cooking water to raise the pH. Perhaps your water has a high pH naturally, Sandra? I like the combination with parsley ‘pesto’. Romano bean are a distinctly different variety to runner beans, they are much larger, and stringless. The flavour is similar though. Melbourne has very soft water…..
Our runner beans are quite large (about 25cm/10″ long) and stringless. We call them “snijbonen”, slice beans, because they are usually eaten sliced diagonally into 4 mm (1/6″) strips. Thanks for the baking soda tip. Yes, they do squeak! The parsley pesto sounds like a perfect accompaniment (+ the olives, of course!). I prefer parsley pesto over basil to be honest. Although an Italian friend of mine used to tell me off for calling it pesto – she considered it a culinary sin a bit like calling sparkling wine champagne. I’ve never tried freezing it though – great tip. Absolutely gorgeous salad, as simple as it looks. I love green beans in the simplest form, let alone it is made so flavorful like this. I remember your salade nicoise. I should learn more about it. I’m a bean fan too Fae and this variety is super tasty! What a coincidence! I bought some of these flat beans (for the first time! out of habit, I usually go for the round ones) at the markets on Saturday… we had half of them last night… and now I know what to do with the other half! Sounds delicious Sandra. 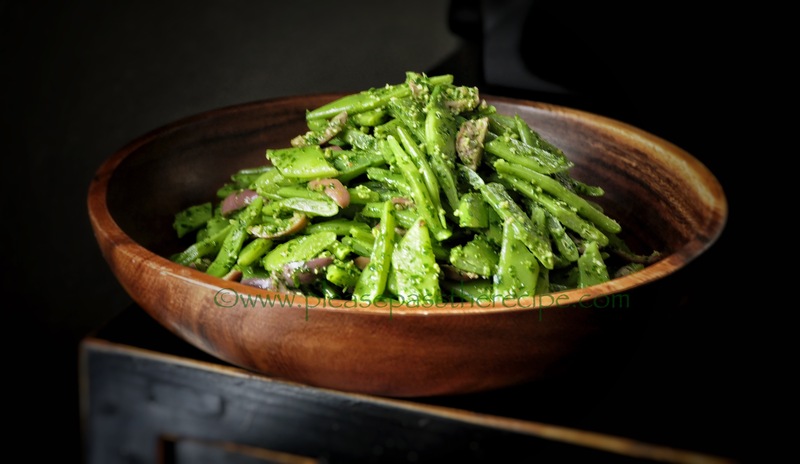 This entry was posted on May 19, 2015 by ladyredspecs in FODMAP diet, Food, Gluten Free, Lactose Free, Light Savoury Dishes, Pantry Essentials, Sauces, Side Dishes & Salads and tagged green beans, parsley, parsley pesto, pesto, romano beans, salad.